to learn more and download the files. The big push for deregulation of electricity has stalled. Most of us know that generally what went wrong and generally know the players involved, but a recent NY Times story cleared up some of my confusion around the issue. "In Deregulation, Plants Turn Into Blue Chips" by David Cay Johnston (who I think wrote a book about big business in energy), explains why those who have experienced deregulation are frustrated, and about to become livid. Because utilities are still allowed to pass on the cost of the power they buy, they have little incentive to choose a cheaper supplier. Electricity customers therefore end up paying more than they would have to if electricity production were truly competitive. After Baltimore Gas & Electric transferred its 12 power plants to an unregulated affiliate and became only a distribution company, it continued to buy 70 percent of its electricity from the plants because there were not enough independent generators to supply the area’s needs. Baltimore Gas & Electric sought a 72 percent rate increase this year, causing such an outcry that Maryland regulators gave it only an immediate 15 percent, but with big additional increases virtually guaranteed over the next few years. I saw an article about this last week which suggested that this dereg has been handled so poorly that even people at the Cato Institute say the regulated system would have been preferable to what we now see. Update: David Cay Johnston wrote Perfectly Legal, which was on the U.S. tax system. This was the second in a series of articles, the first is available here in the NY Times archive. Thanks to David Cay Johnston for the information and correction. Sep/Oct 2006, p6: "A shaky foundation"
Jul/Aug 2006, p6: "Another Perspective: Noted scientist weighs in on climate change issue"
May/Jun 2006, p10: "Political Science: New film puts climate change in headlines"
Mar/Apr 2006, p10: "Myth: Global temperatures are rising at a rapid, unprecedented rate." Jan/Feb 2006, p10: "An astonishing discovery: Recent fnding underscores cautionary approach"
Sep/0ct 2005, p11 - "A hurricane of misinformation global warming activists turn storms into spin"
Jul/Aug 2005, p6 - "Earth’s ever-changing climate state geologist offers his perspective"
May/Jun 2005, p12 - "Alarmist warning; Myth: Carbon dioxide levels in the Earth’s atmosphere are currently at an all-time high." Mar/Apr 2005, p11: "Baliunas debunks Kyoto Protocol"
Jan/Feb 2005, p12: "Myth: Global warming caused the recent tsunami in Sumatra." Hat tip to MCEA for tipping us off to this story. A TV station from South Dakota is reporting on another potential coal plant for the Dakotas. It will be the same scale as Big Stone II though it does not specify what technology the plant will use. I have to assume pulverized coal but I hope I will be corrected by someone who knows more about it. They are looking to produce 600 MW. Basin Electric Power Cooperative is currently searching for a place to site this new plant. Though it is based in North Dakota, 3 potential sites are in South Dakota and one in North Dakota. It will be burning powder river basin coal (low sulfur from Wyoming). to meet some of the energy needs of the country, so we see it as a regional project, a benefit to our community, but also to the country. Without any hint of irony, they have a section of their website devoted to green bragging rights. From the coal mine to the power plant, and from the power plant to the home, Basin Electric has invested in a system designed to meet future energy needs of our consumers while protecting the environment. Naturally, protecting theenvironment means investing heavily into a $1.5 billion coal plant when the entire world knows carbon dioxide emissions are the leading environmental threat of our lifetime. Is that too dramatic? Xcel Energy’s Minnesota Windsource green pricing program lets you buy wind energy in blocks of 100 kilowatt-hours (kWh) for 2 cents/kWh extra. Over 23,000 Minnesotans participate in the green pricing programs at various utilities, buying almost 80 million kWh (which sounds impressive but is something around 1% of total sales). The average price of “regular” electricity is 7.27 cents/kWh from October to May and 8.27 cents/kWh from June to September. Theoretically you add 2 cents/kWh to that for the price of wind energy. However, that’s not the whole story. As a Windsource customer you are exempt from the Fuel Cost Adjustment, which is essentially a way of “truing-up” your bill if the cost of fuel was more or less than what they predicted it would be when they actually went to buy some of the non-contracted fuel on the open wholesale markets. So what? Well, the prices in every month since June 2005 have been higher than they guessed and so you see a little extra FCA charge on your bill each month. The theory for the exemption (the merger negotiation bargain from 5 years ago not withstanding), is that since you are buying wind energy, you aren’t using any of these fuels that have the added costs. In places that use a lot of natural gas (Texas and Colorado), this can make the wind energy the cheaper option in some months. Not Minnesota though, which gets a large percentage of its electricity from coal (41% coal and 3% natural gas for Xcel). But the FCA does add up to something. You’ll note that in August 2005, it was no net cost to use wind energy since the FCA adjustment was right at 2 cents/kWh. 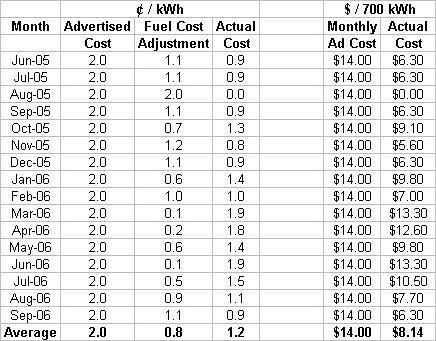 But over the 16 month period, the real cost of Windsource is about 1.2 cents/kWh. The average family thinks they pay $14/month but it turns out to have been closer to $8/month. Does it matter? Would more people sign up if they knew it was 1.5 cents/kWh or less? Maybe. One idea is for Xcel to forecast the FCA or use historical data to reduce the advertised cost of Windsource by some amount, and then adjust the actual Windsource cost similar to the FCA after the fact. To my knowledge Xcel is the only utility that offers an FCA adjustment benefit in Minnesota for buying green power. Also of note is that Xcel has indicated that future wind energy contracts are more expensive than previous ones and holding the line on 2 cents/kWh will be harder since the average cost of the Windsource portfolio may go up. Wind turbine prices have gone up over the last year due to high global demand, cost of steel, and the foreign exchange rate. What's also interesting is comparing whether buying Windsource is the cheapest way to reduce your carbon dioxide emissions. Should you offset your carbon emissions from Xcel or from someone like Terrapass.com, who offers a 14,000 lb annual offset for $70 ($0.005/pound)? Terrapass says there are 1.84 lbs carbon/kWh (which sounds close enough), so some quick math shows that they are charging 0.92 cents/kWh to reduce your carbon. Quite coincidentally, this was the same price Xcel Windsource was in September 2006. However since June 2005, the average price of Xcel Windsource after the FCA was 1.16 cents/kWh (not weighted by use per month, since your bill usually goes up in summer when the FCA is higher). So Terrapass is marginally cheaper than Xcel. Students at several colleges in Tennessee are working for a new fee to be used for conservation and efficiency efforts on campus and for purchase of renewable energy. This would be an interesting policy to look into at the University of Minnesota. It’s not that it is inherently necessary as administrators can increase tuition and use the money for those purposes already. The beauty of it, though, is that it is visible, marketable, and targeted. Perhaps this would allow for a successful end to Dean Abrahamson’s long crusade to put occupancy sensors in all the classrooms. Oak Ridge National Laboratory recently announced more news about a new technology. Using fiber-optics and 48 inch roof collectors, they are lighting buildings with sunlight. The hybrid solar lighting technology uses a rooftop-mounted 48-inch diameter collector and secondary mirror that track the sun throughout the day. The collector system focuses the sunlight into 127 optical fibers connected to hybrid light fixtures equipped with diffusion rods visually similar to fluorescent light bulbs. These rods spread light in all directions. One collector powers eight to 12 hybrid light fixtures, which can illuminate about 1,000 square feet. During times of little or no sunlight, a sensor controls the intensity of the artificial lamps to maintain a constant level of illumination. They are still in beta testing and are trying to cut the costs by one third. It will also qualify for tax credits - good policy. Nonetheless, they see massive potential for it as it reduces not only lighting cost, but air cooling cost as well. That is especially good because it makes the most sense to put these in hot, southern areas that get the most sun. The system can save about 6,000 kilowatt hours per year in lighting and another 2,000 in reduced cooling needs for a total of 8,000 kilowatt hours annually, according to Sunlight Direct estimates. Over 10 years, for parts of the country where the utility rates are 10 cents per kilowatt hour, that can result in savings up to $8,000 per hybrid solar lighting unit. For large floor spaces - 100,000 to 200,000 square feet - this translates into energy cost savings of between $1 million and $2 million over 10 years, according to Sunlight Direct. Operation and maintenance savings could account for another $300,000 in savings over the same period. The New Rules Project (based at David Morris' Institute for Local Self-Reliance in Minneapolis) blog Democratic Energy posted an article today on the latest decision by the California PUC regarding their Solar Initiative. A part of the ruling establishes performance-based incentives that decrease as the program becomes more successful. The payments start out at $0.39/kWh and drop down in steps to $0.03/kWh when the state has an installed capacity of 650MW of solar generation. This addresses one of the common breakdowns, or failures, of technology policy where subsidies stick around past the point where they are needed. This creates situations of "corporate welfare" that can become politically dangerous and a waste of scarce public money. One approach is to have the subsidies end after some period of time. At that point they are then re-evaluated and renewed if deemed necessary. This approach, however, is highly susceptible to politicization where the decisions are based on reasons other than whether it is needed. It also makes long- or mid-term investment in those technologies difficult. The approach taken by the CA PUC is predictable and indexed to a performance measure. It is also, indirectly, indexed to the profitability of the solar systems. As more solar is installed and the subsidy drops it will eventually get to the point at which it is no longer profitable to install systems and the growth will stop. If technology allows for higher profitability at that subsidy level installation will jump again. This should apply continuous pressure for technology innovation that will keep dropping the cost of installation. It also creates a feedback between the cost of installation and the subsidy that should keep them roughly synchronized. There is more to the program that I haven't looked into but I think there are promising aspects that can be used as models for other state or federal programs. I would be interested in what they are also doing with regards to the technology innovation process in order to ensure that promissing new technologies can quickly make it from the laboratory to use. R&D funding is nice but the problem with adoption can so often occur later between the laboratory and the point where venture capitalists are willing to step in. Slashdot has a huge discussion about CFL bulbs. I enjoyed scrolling through the many comments to see what people have to say. Some insightful comments, such as a response to concerns about the mercury in CFL. It is quoted from wikipedia.